Built in 1720 and occupied by the Benton family for 212 years, this is the earliest house museum in Tolland County. 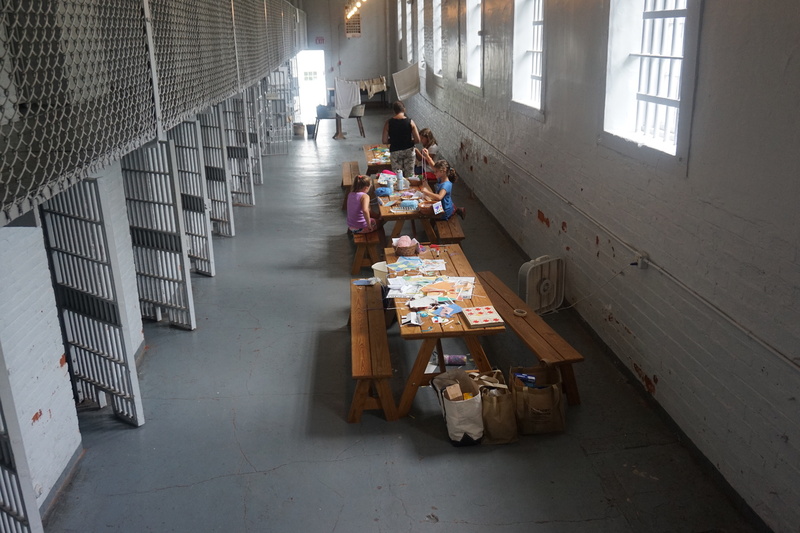 The oldest cellblock dates from 1856, jailer's home from 1893. Thousand of items used in Tolland homes, farms and businesses. Beautiful 1822 courthouse in a transitional Colonial to Federal style with original Palladian window. Courtroom restored to 19th Century appearance. Exhibits. Thank you for another great antiques show! Despite the sloppy weather on Sunday, March 10, antiques lovers from across New England turned out to make the 53rd Annual Tolland Antiques show a success. The many customers joined our dealers who traveled from New York, Pennsylvania and Maine for this high-quality show. Thank you to Show Director Mary-Pat Soucy, Deputy Director Dr. Sharron Laplante and our many volunteers who made the event flow seamlessly. 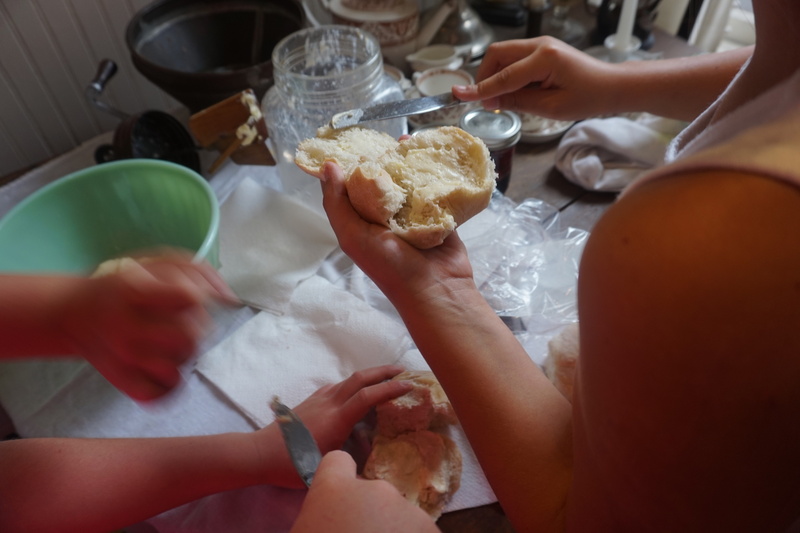 Posted in Uncategorized	| Comments Off on Thank you for another great antiques show! Join us for the 53rd annual Tolland Antiques Show on March 10! Calling all antiques lovers: be sure to join us Sunday, March 10 for the Tolland Historical Society’s largest annual fundraiser – the 53rd annual Tolland Antiques Show! The show will be held from 9 a.m. to 3 p.m. at the Tolland Middle School at 1 Falcon Way. Admission is $10. Parking is free, and delicious lunch choices will be available from Willington Pizza at modest prices. With more than 40 dealers from throughout New England, New York and Pennsylvania, the show is one of the premier events in the Northeast dealing in early Americana. The show will feature 18th- and 19th-century American furniture, accessories, textiles, rugs, prints, folk art, paintings, redware and early iron. Many items are of museum quality. 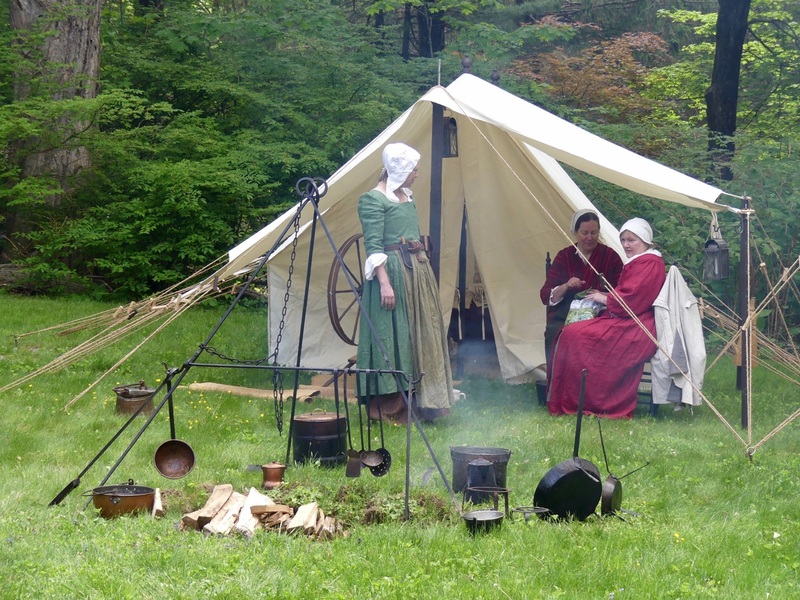 The show is a benefit for the Tolland Historical Society, with proceeds supporting the Old Tolland County Courthouse, the Old Tolland County Jail and Museum and the Daniel Benton Homestead. 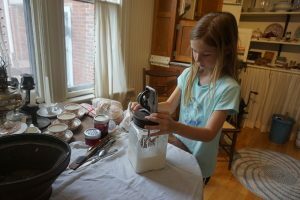 Proceeds also support the many programs that the society sponsors in the community and its curriculum-related programs in the Tolland school system. 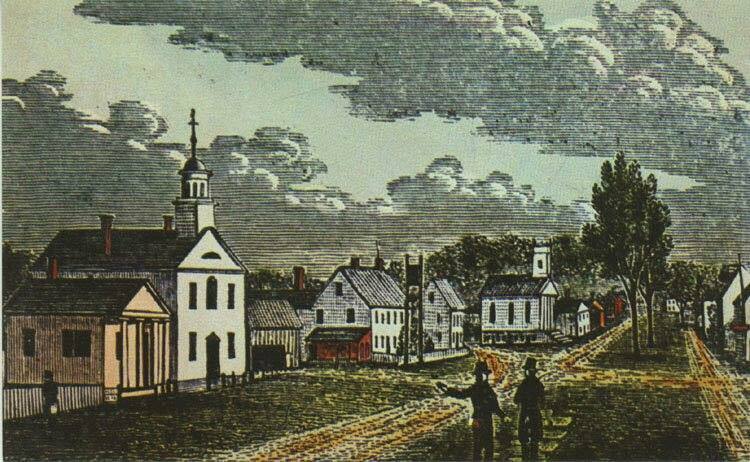 Brownington, Vermont, DAVID MENZIES, Woodbridge, Conn.; CHARLES MUENCHINGER, Windham, Conn.; NEW ENGLAND HOME ANTIQUES, Bruce Henley, Wethersfield, Conn.; OLD BEAUTIFUL ANTIQUES & ART, David Perrelli, Clinton, Conn.; DANIEL & KAREN OLSON, Newburgh, New York; RANDI ONA EARLY AMERICAN ANTIQUES, Wayne, New Jersey; PALISADES TRADING CO.
Greg Hamilton, Vergennes, Vermont, and THE OLE CROWS, Regina McGrory and Eileen Vaughn, East Falmouth, Mass. The show will also feature a display of antique quilts, with each one telling a story. 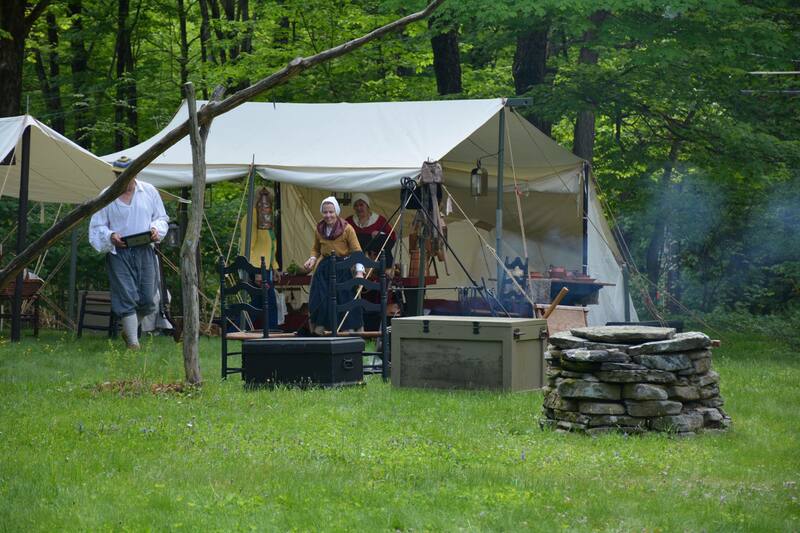 Kate Farrish, secretary of the Tolland Historical Society and author of the Tolland chapter of the “Connecticut 169 Club” book will be selling and signing copies of the book. It features a chapter on each of our state’s 169 towns and cities and costs $24.95, with the proceeds being donated to the Society. 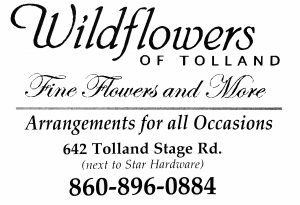 To support the Tolland Historical Society, local businesses can advertise their products and services in three upcoming ways. Your ads can run in the Antiques Show Book at the 53rd annual Tolland Antiques Book, in the quarterly Tolland Times and on the website, at tollandhistorical.org. The book reaches a large audience of visitors and dealers. A full-page, 5 x 8-inch ad in the book is $90; a half-page, 5 x 4-inch ad is $50, and a quarter-page, 5 x 2-inch ad is $35. 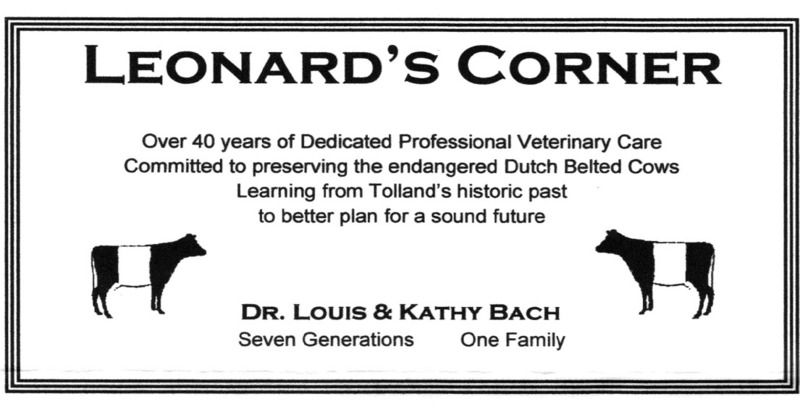 For the past 14 years, the Times has circulated to society members and Tolland residents. 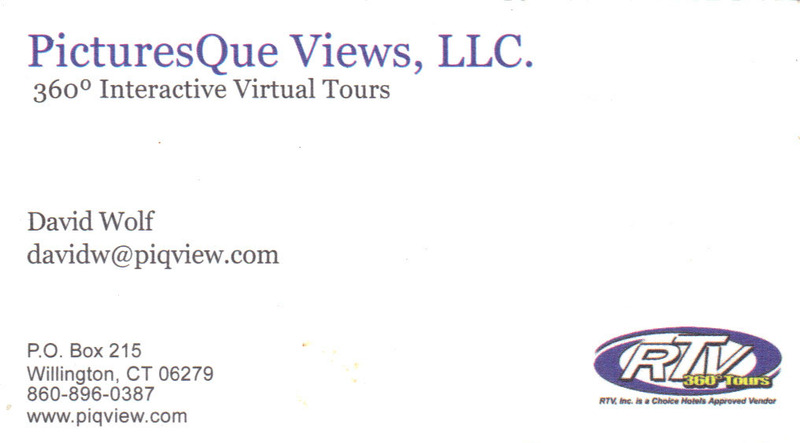 The cost for an ad in the newsletter is $30 for the year if purchased alone, or you can purchase an ad in the Antiques Show Book and spend an extra $15, and you can have double coverage. If you purchase a dual advertising block, you get a free business card-sized ad on the website. To advertise, contact Show Director Mary-Pat Soucy if you are interested in advertising at mpsoucy@comcast.net or 860-803-0034. The deadline to submit advertising materials is Feb. 28. 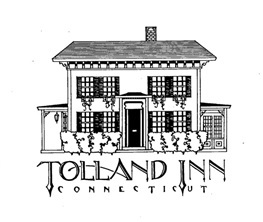 Posted in Uncategorized	| Comments Off on Join us for the 53rd annual Tolland Antiques Show on March 10! The Tolland Historical Society is sorry to announce that the 17th Century weekend planned at the Daniel Benton Homestead for Saturday, Nov. 3 has been postponed due the rainy weather that has been forecast. 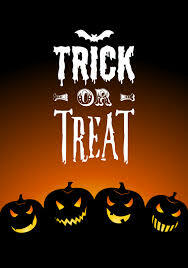 It will be rescheduled for next spring, and we will let you know the date when it is available. 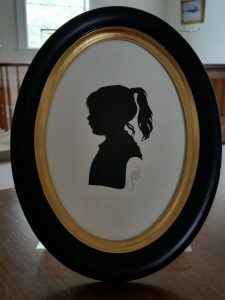 Appointments can be made now for a sitting with silhouette artist Marcella Comerford on Appointments can be made now for a sitting with silhouette artist Marcella Comerford on Sunday, Nov. 11 at an event that will benefit the Tolland Historical Society. By appointment only, Comerford will provide beautiful, hand-cut silhouettes that day at the Old Tolland County Court House Museum. They make a one-of-a-kind gift for the holidays. A portion of the proceeds will benefit the society, which operates the museum at 53 Tolland Green in Tolland. All work is done free-hand, and even wiggly children are welcome. Appointments can be made by signing into www.signupgenius.comand searching for portraitsinsilhouette@gmail.com. 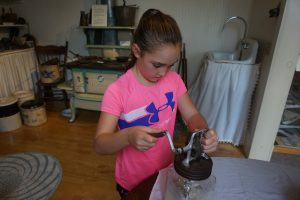 Click on Silhouette Appointments at Tolland Historical Society and select a time. A single silhouette costs $37, with a duplicate costing $15. A 5×7 frame for one silhouette is $35, and an 8×10 frame for two to three silhouettes is $45. Each silhouette is mounted on an acid-free museum board. A portion of each sale benefits the Society. For questions, email Ni-Ni Reinard at nkjtr@sbcglobal.net. First Tolland History Camp is a Success! 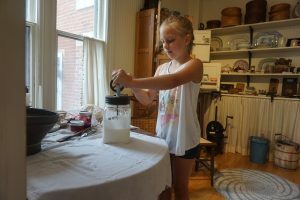 Six girls from Tolland have learned all about life in the 1800s while attending the Tolland Historical Society’s first Tolland History Camp the week of July 23. The camp, lead by instructor Talie Lyon, 15, and Society President and Museum Director Kathy Bach, has been held at the Old Tolland County Jail and Museum. The girls, all going into the fourth grade this fall, churned butter, made ice cream and pudding, learned about the museum’s exhibits, washed and wrung out clothes by hand and learned crafts such as quilting and quilling. This Friday, July 25, they’ll dress in period costumes and go to the nearby Hicks-Stearns Museum on Tolland Green for a formal tea. Abbie Poulin tries her hand at churning butter. 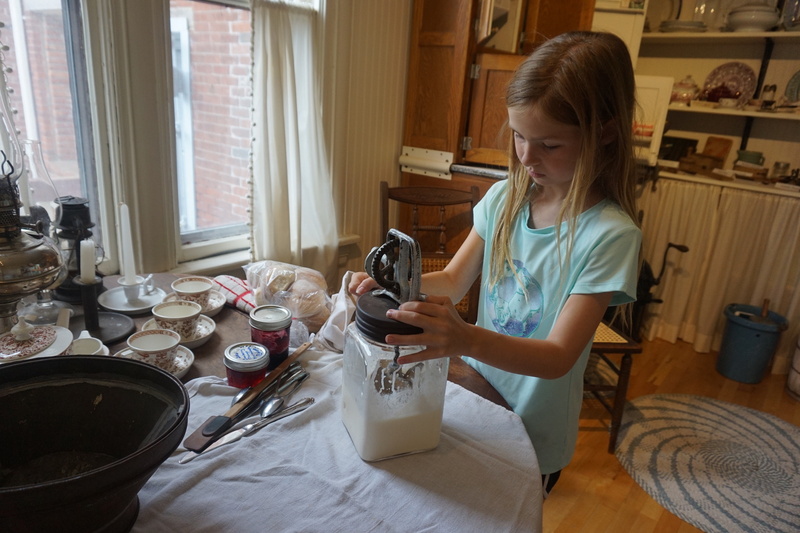 It’s Aubrey Peters’ turn to make the butter. The campers sample the butter they churned. 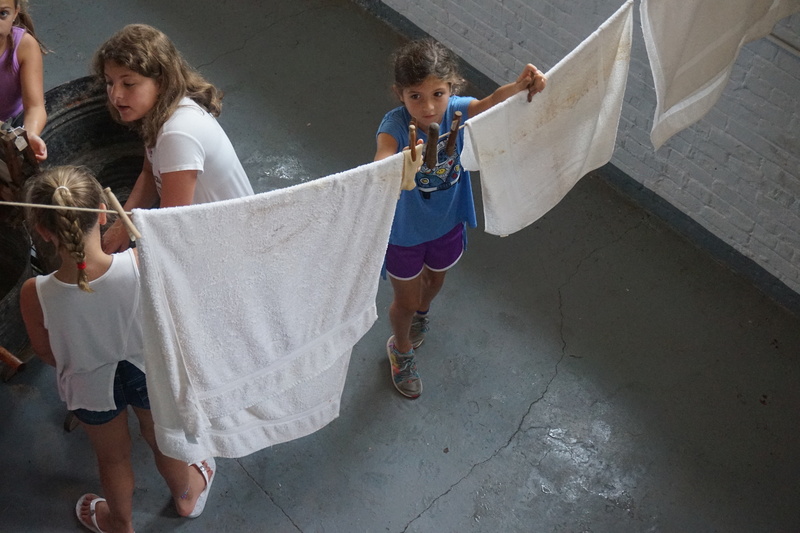 The campers learned how to wash and dry clothes the old-fashioned way. 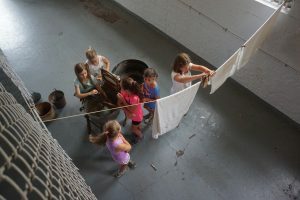 Camper Mia Santini, 8, hung up the clothes to dry in the cellblock of the Old Tolland County Jail. Ava Sapere, 8, at left, and Mia Santini, 8, practice weaving on hand looms at history camp. 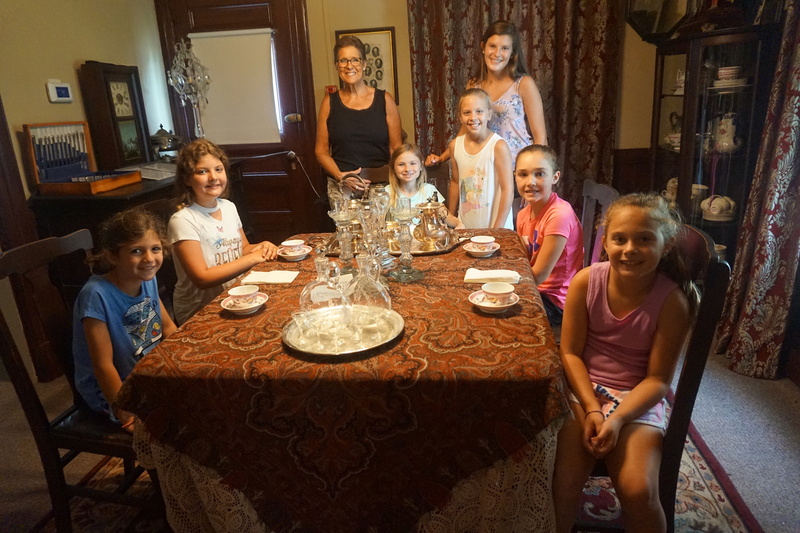 The campers and their leaders, from left: Mia Santini, Kaylee Edgar, Museum Director Kathy Bach, Abbie Poulin, Grace Condos, instructor Talie Lyon, Aubrey Peters and Ava Sapere. 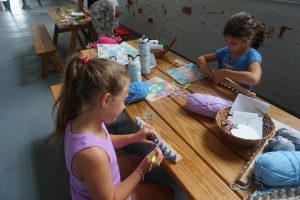 Posted in Uncategorized	| Comments Off on First Tolland History Camp is a Success!